The winners of the 2016 Label Industry Global Awards were announced yesterday at a gala ceremony which took place after the opening day of Labelexpo Americas. Held at the Rosemont Theatre, Chicago, the awards recognize the notable achievements and commercial creativity of label industry manufacturers, suppliers and converters over the last twelve months. Outstanding personal performance and accomplishment was marked by 400 industry colleagues as Mitch Butier, president and CEO of Avery Dennison paid tribute to Belmark’s Bruce Bell. 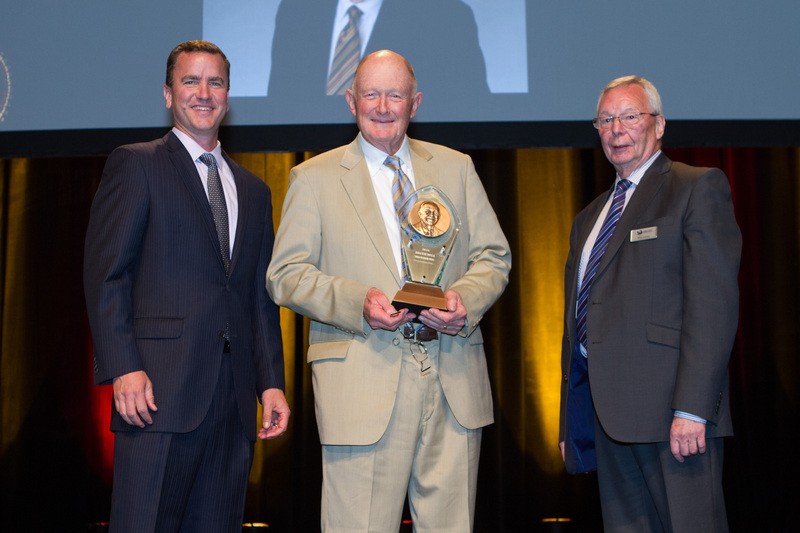 Bell was bestowed with the R. Stanton Avery Lifetime Achievement Award at the ceremony to honor his continuous commitment to supporting the industry throughout his long career. A highly-regarded ambassador for label printing, Bell was singled out for not only his success in establishing Belmark in 1977, but for actively encouraging and inspiring upcoming talent through his involvement with the TLMI. Bell joins fellow luminaries GSI Technologies’ Suzanne Zaccone, Steve Lee of RotoMetrics, FLEXcon’s Neil McDonough and inaugural title holder, Dale Bunnell of Mark Andy. In addition to the Lifetime Achievement Award, three other category winners were unveiled. The Award for Innovation (for companies with over 300 employees), sponsored by Flint Group Narrow Web was presented to Jindal Films Americas for its development of Platinum Thermal. A white surface-printable polyolefin film, Platinum Thermal looks set to revolutionize thermal/bar code printing, replacing both coated and direct thermal substrates and thermal transfer ribbons in many thermal label applications. It is said to be one of the few ‘breakthroughs’ that come once every 20 years. Eshuis BV collected the Award for Innovation (for companies with less than 300 employees), sponsored by Flint Group Narrow Web. Eshuis was requested by Coca-Cola to develop an industrial 3D bow label which, after a year and half of research and development, resulted in a three-layer bow which could be applied at 40,000 bottles per hour as a standard Coke wrap-around label. In association with Constantia Flexibles, more than 130 million labels were produced, divided over 21 different sizes of bow label. It increased Coca-Cola’s sales volume and had a huge impact on social media channels. Dow Chemical Company received the Award for Sustainability, sponsored by Jindal Films for its Chemical Sustainability Tool initiative. The tool has been designed to enable teams to quickly evaluate sustainability challenges and opportunities, document their thoughts and create an effective visual way of communicating the results. The tool engages a wide employee base in sustainability and indicates the extent to which any development can contribute to a more sustainable world. Chaired by Mike Fairley, the judging panel presiding over this year’s awards featured: Michael Ritter, vice chairman of the TLMI, Thomas Hagmaier, president of FINAT, Steve Katz, editor of Label & Narrow Web, Armin Karl Geiger, editor of NarrowWebTech and Andy Thomas, group managing editor of Labels & Labeling.